Decline. Is there anyone alive who does not fear it? Is there a way to ascertain the beginning, the end of the beginning, or the beginning of the end? How is to be avoided? More importantly, what is it? J.D. Vance tackles the topic in a moving and personal memoir entitled, Hillbilly Elegy: A Memoir of a Family and Culture in Crisis. 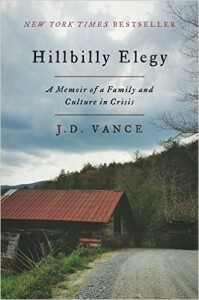 In the introduction, Vance describes himself as a Scots-Irish hillbilly at heart. He lets us know that his tribe is a pessimistic bunch. Caught up in the belief that to look through a glass darkly is to be avoided at all costs, I was drawn into the story right away. We know from the beginning that J.D. Vance climbed from his uncertain origins to graduating from Yale law school. The story outlines the journey. It is uplifting because there is not a person alive who does not wonder if they had been born in unfortunate circumstances, or were challenged by terrible poverty, would they be one of the few to make it out? Readers are placed squarely into the houses and schools and yards of Vance’s life with an almost breathless desire to see him succeed. While he does not pretend to have the answers, he neither blames nor preaches; the book reads as a statement of fact. Look about. Going back to the Scots-Irish, or the Ulster Scots, and the roots of their beginning, I knew from learning about the English Civil War, that the term goes back to the plantations of Northern Ireland. Cromwell gave vast tracts of conquered land in Ireland for the Scots to settle. Many had been soldiers in his army and this new land represented the spoils of war. It was hoped that they would take root and serve to be a permanent anchor in Ireland. That set the stage for centuries of conflict and strife. They had to fight to maintain their foothold, and fight they did. The second migration to America yielded a group who settled in the hills of Appalachia to eke out a living. We know that George Washington used them handily, as did Stonewall Jackson. Wanting nothing more than a fair shot at the American dream, and never asking for help or handouts, became a hallmark of their values. As the jobs became scarce and the resources few and far between, what we learn from Vance’s experience is that we need to understand this despair. To say this book struck a cord with readers is an understatement. Currently, it is topping the charts of the New York Times Bestseller list. A memoir, written with such clarity and ease, will always do well, but the success of this book speaks to something larger. We are in a time when everyone seems to be scratching their heads. Hope is infectious, and there is much in this book that provides it. We learn that when Vance applied to Law School he automatically eliminated the big Ivy League choices thinking that he would neither qualify nor be able to pay the tuition. When I became an American Citizen, in my welcome packet was a letter from the President encouraging me to take advantage of the many opportunities before me. I could not think of a nicer welcome. Not knowing what else to do with that information, I kept my eyes and ears open. What Vance is writing about is all too familiar. I know what it is like to grow up in a family whose ethic is based on hard work and never taking handouts of any kind. It is the most uncomfortable feeling in the world to choose to succeed knowing that you may not have the support of those closest to you. Do it anyway. That is the great message of this book. “Hope is the thing with feathers,” wrote Emily Dickinson. What were her chances of achieving any success as a poet, let alone immortality? The crisis of any culture is solved when the challenge is met, and necessary changes are made. That is what enabled J. D. Vance to travel from the “holler,” to Ohio, to the Marines, to College, to law school and then to where he is today sitting at the top of the charts. This entry was posted in Memoir, Motivation and tagged American dream, American History, crisis, culture on October 25, 2016 by Elizabeth Smythe Brinton.